The best way to dispose of a zombie without alerting an entire horde would be by a throwing knife! 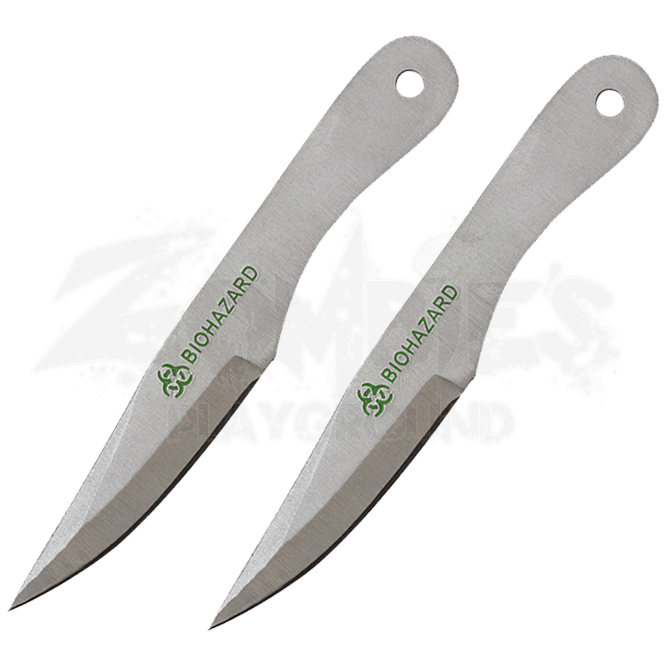 Whether a real undead or a dummy target, no tool that will succeed quite like the 2 Piece Biohazard Chrome Drop Point Throwing Knives! Crafted entirely from fine 440 stainless steel, this pair of throwing knives offer a sleek drop point silhouette, perfect for easy control when you need a solid stick in your target. The sleek satin finish on each of the blades highlights the single-edged design and prominently displaying the iconic biohazard symbol carved into the center. When no zombies are around or you dont have time for practice, tuck the blades away into the sturdy nylon case for quick and easy storage! Survival does not solely depend on weapons, but your chances rise with each tool you have at your disposal. Whether you need to survive a tournament or an apocalypse, your chances of surviving will skyrocket when you pick up the 2 Piece Biohazard Chrome Drop Point Throwing Knives!